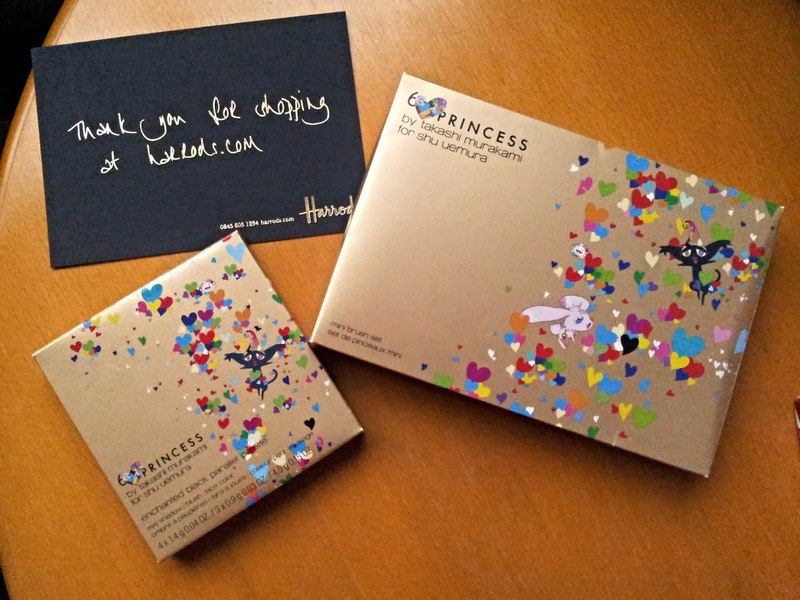 So the boy treated me to a final post Christmas present, from Harrods no less! Squeeeee. 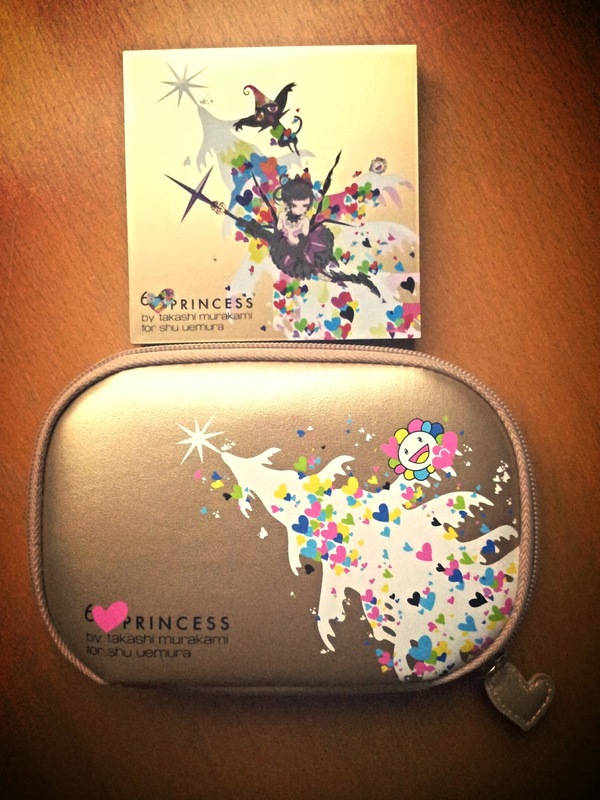 Now as the viewing public may know, I'm a touch obsessed with the 6 Heart Princess line from Shu Uemura and these were the final pieces to my mini collection. Look at that gorgeous packaging! Lookit at all the pretty colours! The boy did good, so good. 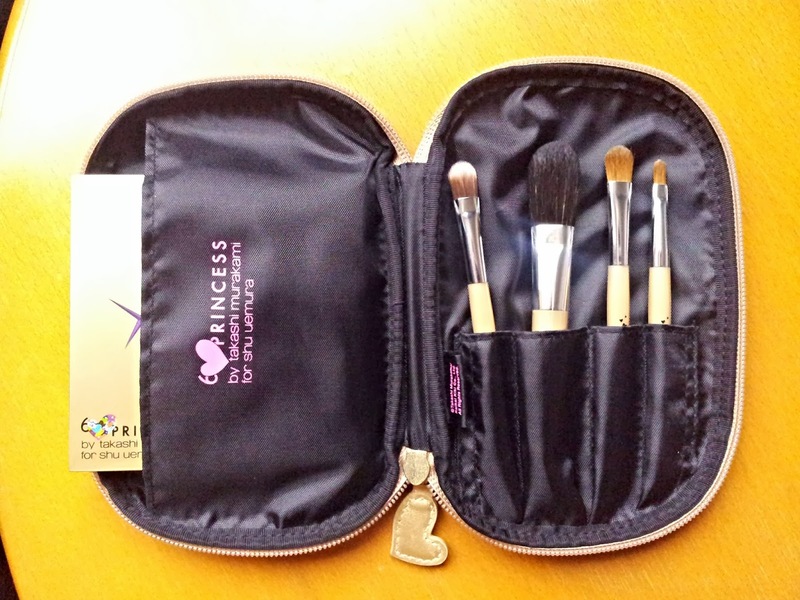 I love the travel brush set, and get this the palette fit perfectly inside the brush case! Lighter travel make up is achievable. The only brush missing in my eyes is a proper eyeliner, really not keen on the idea of using my lip brush on my eyes. Now the palette! The colours are beautiful, check out that green in the bottom left! The gold is a darker shade with a yummy shimmer to it, the silver is your classic silver sadly nothing too special there, but handy for eveningwear. Speaking of eveningwear, the black is a brilliant option for a glittery (it is jam packed with sparkle) smokey eye for when you're feeling that little sultry, making use of the pale pink pearl to highlight where needed. The pink is very pale with a pretty subtle shimmer to it and works very nicely with the matt dusty lilac next to it. Utilise the darker satin purple to turn your daytime look to an elegant night time. Lastly that green, the colour that first drew me to this palette and induced maximum squeeing. 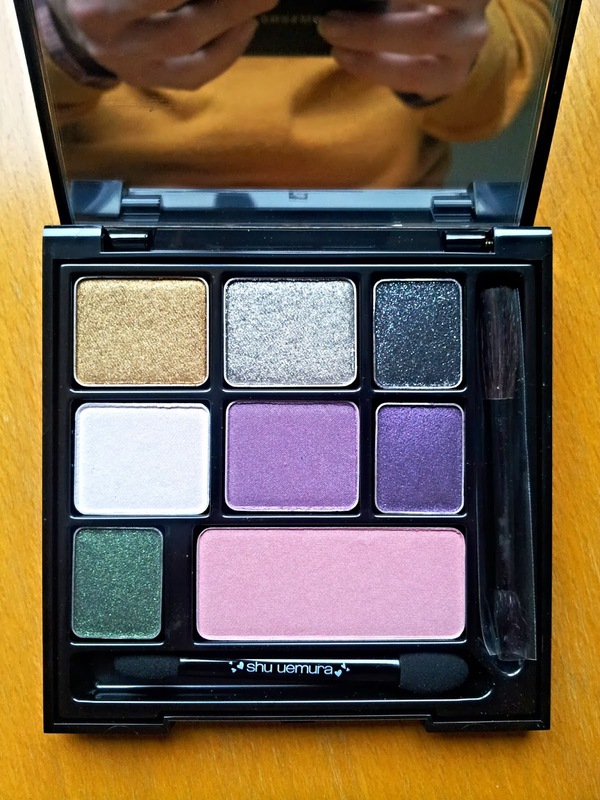 I love green eyeshadows, and this shimmer packed moss is perfect in my world. The gold/blackened green micro glitter catches the light really well and i just can't get enough of it. All the eyeshadows are all really silky, and go on like a dream. The blush across the bottom is actually much darker than the pale pink it appears in the photo. Far more flattering than it first appears here, the only bad point for me is that there is not a trace of shimmer in the blush either, so you may need a highlighter to get a full glow from this colour. And that's it for the 6HP range, for now anyways from me. I'm finally satisfied with my little anime haul, (although I pine a little for the Heroine Plum lip colour...). The main Shu Uemura may still have some stocks left, (this was a holiday line), as may other big retailers. Try your department store websites, as they may still have them on sale too. UK readers can still find it Here (not on sale though...foo).